A year in the life of the "Big Ginkgo of Kuwanomoto". Location: Close to a temple, Toyooka, Hyōgo Prefecture, Takeno-cho, Kuwanomoto, Japan. Height 48 m, girth 9.9 m, planted c. 1650. Video by Jiro Fujiwara on YouTube. 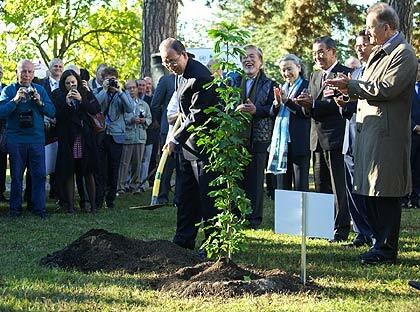 UN Secretary-General Ban Ki-moon plants Hiroshima A-bomb survivor Ginkgo sapling as a symbol of peace in the UN European Headquarters, Geneva. This Ginkgo sapling is a direct descendent of one of the oldest living trees in Hiroshima’s historical Shukkeiin Garden. * Update new topic: 2nd generation A-bombed Ginkgo tree planted at UN Geneva, Oct. 3. * New photo on Photospecial page: Old Ginkgo tree, Maldegem, Belgium + video.